Over the past couple of months, Europe has taken center stage in driving investor sentiment. This past weekend was even more pronounced as we watched Spanish elections, questioned the refusal of Antonis Samaras, leader of Greece’s top conservative party, to sign an oath that he will approve austerity measures, Germany lowered its economic growth forecasts and rating agency Moody’s grew increasingly concerned about French debt. Not to be outdone, our friends in Washington have all but given up on the so-called U.S. debt “supercommittee”, which is failing in its debt reduction goal. Not surprisingly, market reaction has been terrible. The issues in Europe and Washington have been at the forefront of investor minds. However, stock market performance should encompass multiple factors. With this in mind, we believe investors have failed to consider the quintessential three pillars of stock market performance – the economy, interest rates, and corporate profits – in their investment decisions. Over the past few months, U.S. economic data has shown remarkable improvement. Weekly jobless claims are now at their lowest levels since April. Housing has seemingly found some type of bottom as both housing starts and permits to start building new homes are exceeding expectations. The index of leading economic indicators has bounced higher and consumer prices continue to fall. On the interest rate front, the Federal Reserve has vowed to keep rates low until 2013 through policy. To the consumer, this results in lower credit card rates and the ability to get low mortgage rates. The result is that consumer debt has come down quite dramatically. 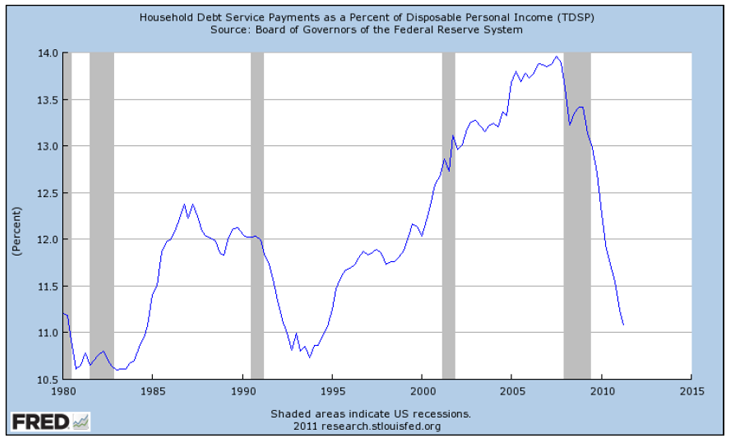 The chart below shows the significant drop in household debt as a percentage of personal income. This sharp drop suggests that consumers are repairing their personal balance sheets. On the earnings front, companies continue to post strong results. According to Thomson Reuters, through November 18th, of the 482 companies in the S&P 500 that have released third quarter earnings, 70% have beaten expectations. Profits, which are considered the main driver of stock prices, continue to exceed expectations. Looking forward, the price-earnings ratio of the S&P 500, a common valuation measure, is 11.6X (source: Thomson Reuters) and is trading at the lower end of its historical range. Investors remain focused on Europe and its potential impact on the global economy to drive stock market performance. Yes, the potential impact of Europe might be significant on stock prices, however, focusing exclusively on one factor is not the best investment strategy. Instead, taking a step back and gauging the broad range of market factors that have historically driven equity returns – economic data, interest rates and corporate earnings – should also be considered. With valuations at the low end of their historical range, economic data showing improvement, interest rates low and corporate profits rising, the market backdrop may not be as dire as some would want you to believe. With that said, we are not waving the all-clear signal. Instead, slowly adding equity exposure (especially in the form of dividend-paying companies and more defensive sectors) may be a sensible investment strategy at this time. This information is compiled by Cetera Financial Group from source material obtained or provided by US federal and state departmental websites, equity index sponsors Standard & Poor’s, Dow Jones, and NASDAQ, credit ratings agencies Standard & Poor’s, Moody’s Ratings, Fitch Ratings, domestic and foreign corporate issued newswires and press statements, and from referenced compilations and index readings by Bloomberg Professional. The information is believed to be from reliable sources; however, we make no representation as to its completeness or accuracy. The information has been selected to objectively convey the key drivers and catalysts standing behind current market direction and sentiment.